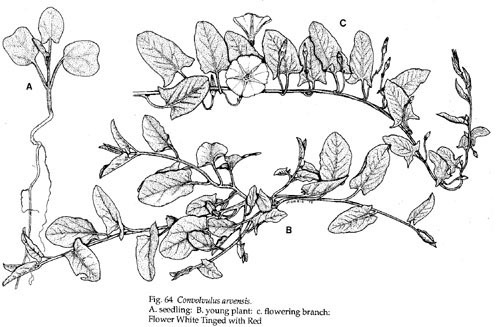 Growth Habit: Bindweed grows long tangling stems, which can cover 2m in diameter. The leaves are alternate and are triangular in shape. Main growth is during spring to summer. Type of Plant: Bindweed is a perennial, creeping vine. Flowers: The flowers can be white or pinkish. Fruit/Seed: Seeds are produced in a pointed capsule. 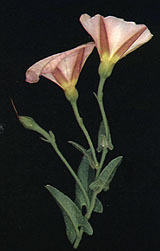 Dispersal: Bindweed reproduces by seed, which germinate in autumn and winter. Soil movement and water mainly disperse seed. 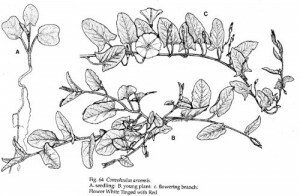 Distribution: Bindweed is found in gardens, run down pastures, many crops, vineyards and waste places. Bindweed can be a very competitive plant in many crops and vineyards, where it reduces production and interferes with harvesting. Grubbing (all year). Isolated plants may be manually removed with a fork or similar tool. Herbicide (summer, spring and autumn). Herbicides registered in Tasmania include MCPA, triclopyr and glyphosate. If the bindweed is in a crop, consult the D.P.I.W.E. for more specific information. This info available as a PDF (560 Kb) – click here.